Speech Room News has a great new feature she is doing on her blog once a month. 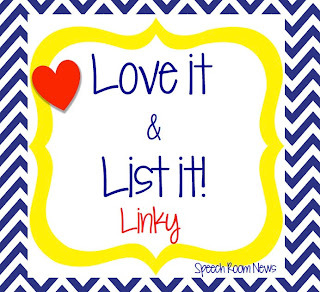 It is a linky where bloggers can "link up" and leave lists of things they love pertaining to a certain topic each month. This month is Games I Love! I have a few go to games that my students always request. 1. The first one is Go For The Dough from Super Duper, Inc.
My students constantly ask for this game. 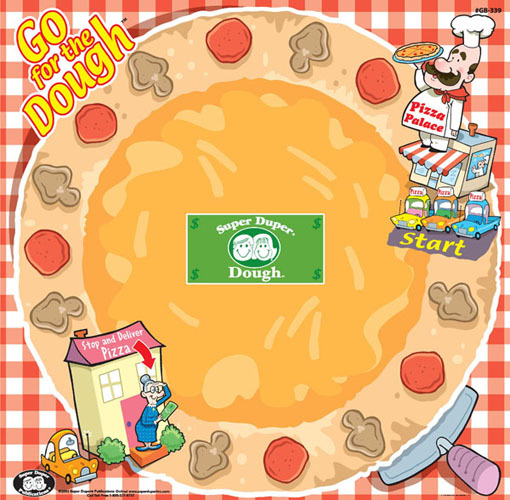 Basically, you just use game pieces to go around the game board and try to deliver pizza to granny. For each turn, you have to answer a question to earn a dollar. The dollar goes in a pot in the middle. If you land on granny, then you get to keep all of the money in the pot. I use the game the way it is intended with the money, but I also use it just as a reinforcing game. To use it with the money, you follow the directions on the money. 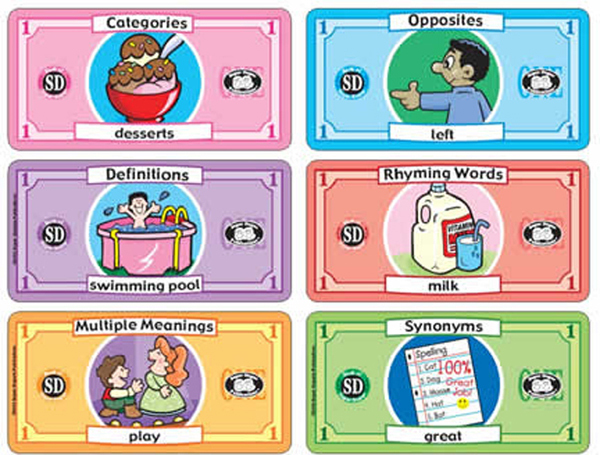 There are six different areas to target: Categories, Opposites, Definitions, Rhyming Words, Multiple Meanings, and Synonyms. For the categories area, I usually make my students name as many items in the category as they rolled on the dice. I also use it as a reinforce with the dice and just put random money in the pot. 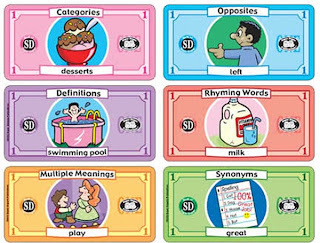 With articulation, for example, I have the students roll the dice, say as many words or sentences as the dice indicate, and then put a dollar in the pot for them. My students LOVE trying to win all of the money! 2. Another of my most requested games is Apples to Apples Junior. I will usually let students pull this out for "special occasions". Each person gets 5 cards that have something kind of silly on them. Some examples are: monkeys, sand castles, my teacher, Cinderella, pickles, etc. Then, a "judge" is chosen. The judge picks a card from another pile that mainly consists of adjectives such as: crunchy, smelly, cool, freezing, etc. The judge reads the card, and then the remaining players need to decide which of their 5 cards most closely matches the description. The students crack up at some of the choices. The judge then decides which card matches the adjective card the best, and then that person gets to be the judge. 3. 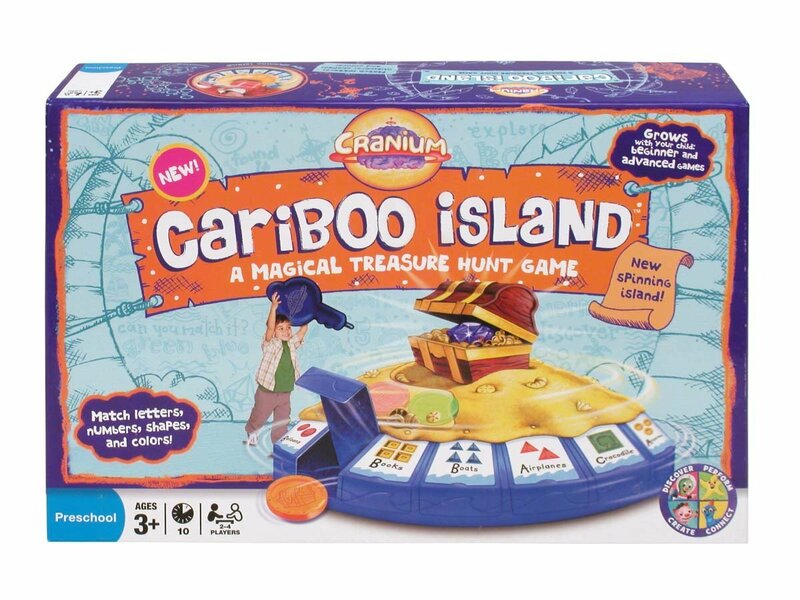 The third most requested game in my speech room is Cariboo Island. Unfortunately, it is out of production now, but you could get lucky and have a great find at a second hand shop. In this game, students pick a card that has a number or shape on it and then have to find a corresponding card on the spinning game. They get to use a key to open the latched door and see if there is a token inside. If there is, they put it in a little plastic slider on the top of the game. When they find six tokens, a treasure box opens! 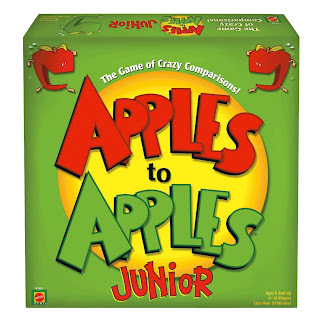 My students love to play this game as a reinforcer to multiple areas, articulation and language targets. I have also created my own cards that we use with the students in our social language group for conversation and feelings. You can see how I used it to work on feelings HERE. I know I have talked about this before, but I really do love this game! Thanks for checking out my favorite games! What are your favorites? I don't have GO for the Dough! Might have to watch for that one to go on sale! Great ideas. 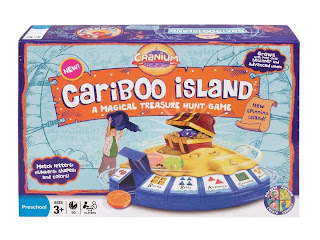 Cariboo Island is on my Goodwill radar!